The Gene-ius Day program introduces students from grade 4 through 12 to basic genetics and the function of DNA. The Monsanto Fund has provided a number of grants to schools and environmental nonprofits in Hawaii in support of science education and conservation efforts. 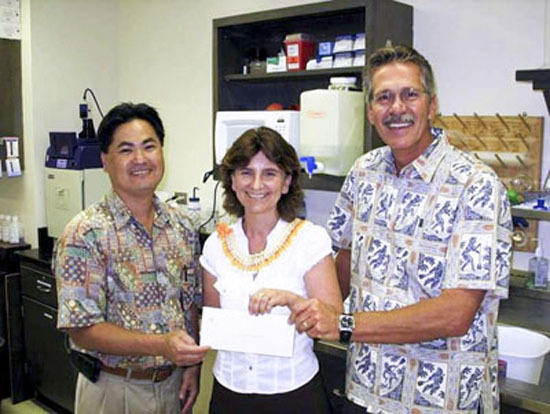 Monsanto Hawaii additionally offers scholarships to students pursuing post-secondary degrees in science and agricultural technologies, and sponsors science fairs and other educational programs. Monsanto’s farm stations in Hawaii work to develop better-quality seeds that will help farmers grow yield sustainably so the farmers can be successful; produce healthier foods, better animal feeds and more fiber; and help reduce agriculture’s impact on our environment. The company recently completed a new employee building and 69,000 square foot seed facility at its Kunia Research Station on Oahu. The Monsanto Fund is the philanthropic arm of the Monsanto Company. Incorporated in 1964, the Fund’s primary objective is to improve the lives of people by bridging the gap between their needs and their resources. The Monsanto Fund is focused on grant-making in three main areas: nutritional well-being through agriculture; science education, primarily on professional development for teachers; and improving the quality of life in communities where Monsanto employees live and work. The College of Tropical Agriculture and Human Resources (CTAHR) is committed to the preparation of students and all citizens of Hawaii for life in the global community through research and educational programs supporting tropical agricultural systems that foster viable communities, a diversified economy, and a healthy environment. CTAHR actively helps Hawaii diversify its economy, ensure a sustainable environment, and strengthen its communities, and serves as the premier resource for tropical agricultural systems and natural resource management in the Asia-Pacific region. The University of Hawaii at Manoa serves approximately 20,000 students pursuing more than 225 different degrees. Coming from every Hawaiian island, every state in the nation, and more than 100 countries, UH Mānoa students matriculate in an enriching environment for the global exchange of ideas. The University of Hawaii Foundation, a nonprofit organization, raises private funds to support the University of Hawaii System. Our mission is to unite our donors’ passions with the University of Hawaii’s aspirations to benefit the people of Hawaii and beyond. We do this by raising private philanthropic support, managing private investments and nurturing donor and alumni relationships.